Running at 4000 m: the hypoxic chamber (altitude training). Have you ever thought about training at altitude? If you are a runner with passion for mountains, probably the answer is affirmative. Wikipedia says that “the basic concept of living or training at altitude is to cause the body to adapt to the lower oxygen content by producing more oxygen-carrying red blood cells and hemoglobin. This improves the athlete’s ability to perform work, because more oxygen is available to the working muscles”. At sea level the air contains around 20.9% oxygen. On the top of Mount Everest (8848 m), too. Why do we say, then, that there’s less oxygen? The difference is all in the air pressure: at sea level there is a pressure over our heads equivalent to 10 m of water. At 8848 m this pressure is equivalent to around 3.5 m of water. The percentage of the oxygen is the same, but being the pressure lower, the molecules are less compressed and, thus, more distant from each other: there are few molecules of everything in the same volume. That’s why the oxygen intake is lower, if the respiration rate is the same. Does this kind of training really improve performance? 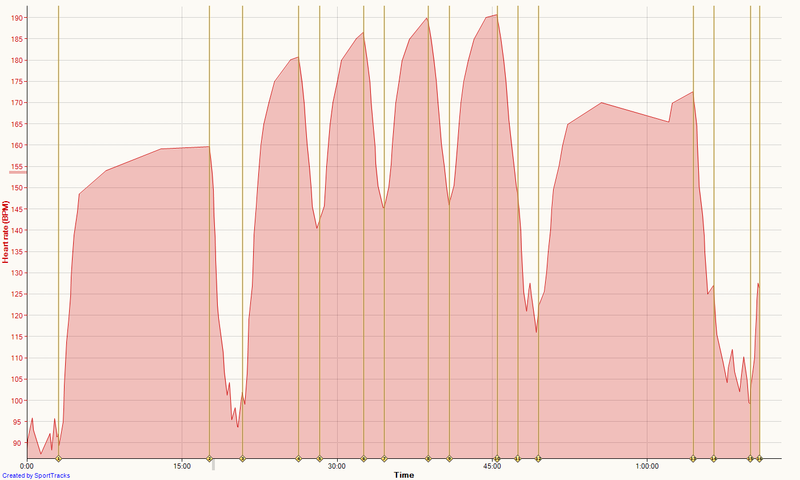 One thing is for sure: training at altitude (simulated or not) is hard! 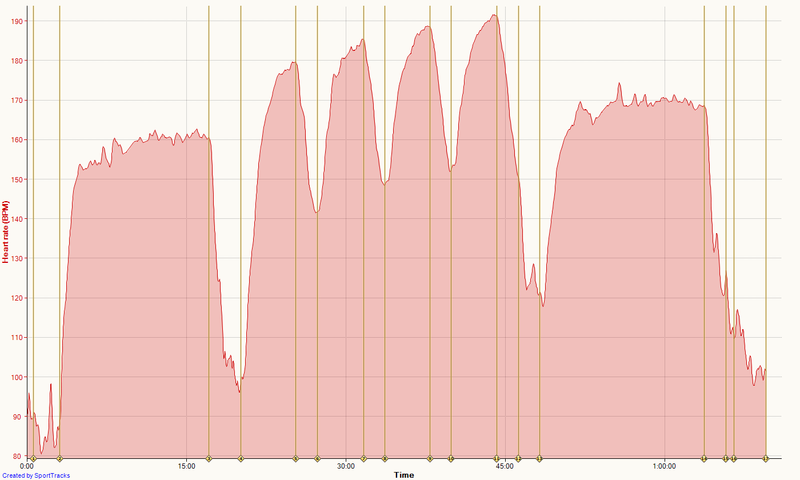 Cool-Down (1.0 km @ 4’15″/km, 1.0 km @ 4’35″/km, 1.0 km @ 5’00″/km). HR acquisition of the 4000 m training (06/01/2012). CD (3.10 km @ 4’35″/km). Unfortunately the acquisition of the first training is pretty bad, but the data are very clear in the second graph. HR acquisition of the first 2500 m training (09/01/2012). HR acquisition of the second 2500 m training (11/01/2012). When the oxygen percentage goes under 14%, things are really difficult: the recovery time appears to be far useless (actually it isn’t, but my body said the opposite), breathing is difficult and HR cannot increase (188 out of 195 bpm, that is my max threshold) or decrease (150 bpm the lowest value between the repetitions) too much. For values of oxygen around 15%, everything is much easier and you can carry on your workout without any particular problems, even if the paces are slower than normal (the recovery time starts to be useful!). Obviously if you train at low oxygen percentage, you should being constantly monitored: the oxygen saturation in the blood shouldn’t go under 80%, to stay distant from hypoxemia risk (the use of a pulse oximeter, a device that uses a red and an infrared light to measure indirectly the oxygen saturation of the blood, is the easiest way to stay monitored). 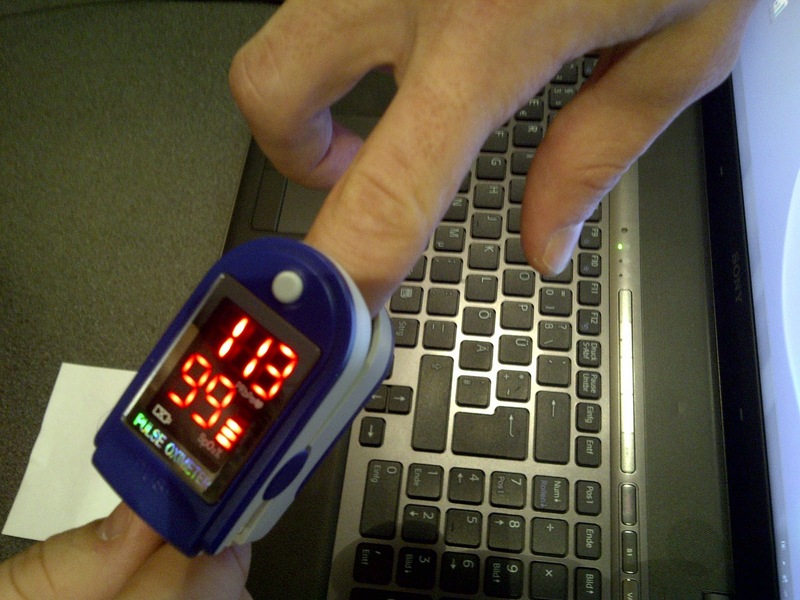 Blood’s oxygen saturation monitoring right after the training session. 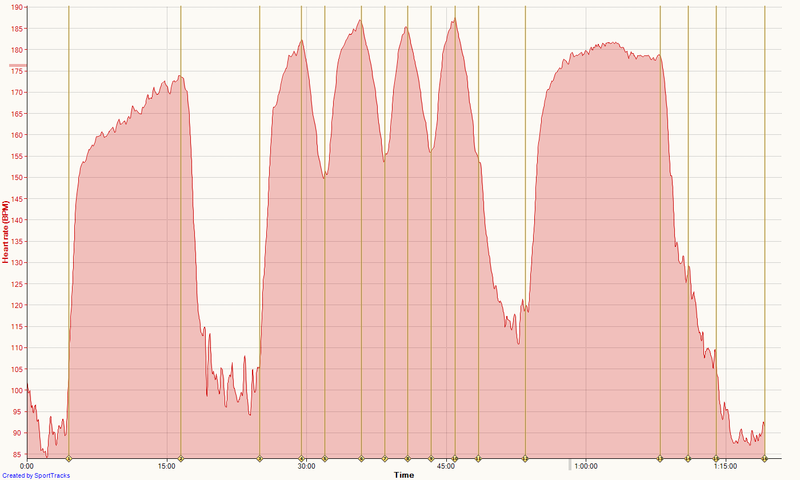 For the record, al the data have been acquired in the Himaxx Center for Altitude Training in Berlin (Germany). If you have any question don’t hesitate to contact me! Keep on training! ← MAMMUT® presents: the biggest peak project in history – "The Zuitas™" are planning their tour.